Atlantic Monthly Press, 9780802125118, 416pp. 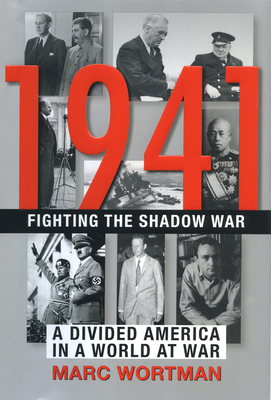 In 1941: Fighting the Shadow War, A Divided America in a World at War, historian Marc Wortman thrillingly explores the little-known history of America's clandestine involvement in World War II before the attack on Pearl Harbor. Prior to that infamous day, America had long been involved in a shadow war. Winston Churchill, England's beleaguered new Prime Minister, pleaded with Franklin D. Roosevelt for help. FDR concocted ingenious ways to come to his aid, without breaking the Neutrality Acts. Launching Lend-Lease, conducting espionage at home and in South America to root out Nazi sympathizers, and waging undeclared war in the Atlantic, were just some of the tactics with which FDR battled Hitler in the shadows. Marc Wortman is an independent historian and award-winning freelance journalist. He is the author of two previous books, "The Millionaires' Unit: The Aristocratic Flyboys Who Fought the Great War and Invented American Air Power" (the inspiration for the prize-winning, feature-length documentary by Humanus Films) and "The Bonfire: The Siege and Burning of Atlanta." He has written for many popular publications, including "Smithsonian, Vanity Fair, " and "Town & Country," and his essays and reviews appear frequently on The Daily Beast. He and his family live in New Haven.